Well would you look at that? Another Broadway musical adapted from the big screen. What will they think of next? For those of you keeping count Finding Neverland is the fourth show this season that was a movie prior to becoming a Broadway musical. Thank goodness for Fun Home and Something Rotten or we would not have any original musicals on Broadway this season. Now don't get me wrong. There is plenty of room for all types of shows on the Great White Way. That's why New York is the theatre capitol of the world after all. There truly is something for everybody. But enough about what I think. You came here to get more info on Broadway's newest show Finding Neverland. So let's get right to it shall we? Now like with Doctor Zhivago I have never seen the film. What can I say? I'm just more of a theatre guy I guess. The show which is based on the 2004 movie first premiered at the American Repertory Theatre in Cambridge, Massachusetts last Summer where it broke box office records. Now here we are nearly nine months later and the show has grossed over a million dollars at the box office week in and week out since it began previews last month at the Lunt-Fontanne Theatre. I guess it's a hit. Now the big question is will the critics like it? We will find out on April 15. My guess is that even if the reviews are mixed it won't matter all that much. After all Wicked didn't get the greatest reviews and it has been playing to packed houses for eleven and a half years. Now for those of you who want tickets to see Finding Neverland you have come to the right place. In fact from now thru June 7 you can see the show for some amazing prices. Just speak to one of are friendly ticket experts at Applause and ask about our "Insider Prices" and we will take care of the rest. It's that easy. 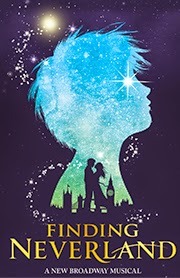 Get your tickets to see Finding Neverland at the Lunt-Fontanne Theatre on Broadway. Until next time theatre fans.